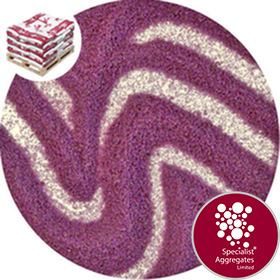 Fine purple coloured sand, colourfast, non-staining and suitable for use with water. Suitable for urban recreation, art installations and staging. Coverage: 16 packs will cover approximately 6sqm at 25mm depth. 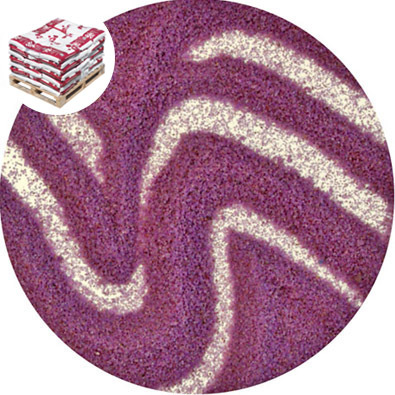 Purple coloured sand manufactured by Specialist Aggregates in the UK using non toxic organic pigments and resins. This river-worn sand has been specifically chosen and graded to ensure that harsh "gritty bits" and dust are removed, allowing our clients to specify and use with confidence for pop-up urban recreation, art installations, and event staging. This product is colourfast, non-staining and suitable for use with water. Sensible precaution: Rinse first in clean water to remove any undersized coloured particles. Similarly, if required the sand may be cleaned by rinsing in clean water. Variations in colour and grain size may occur from batch to batch. Part 1 : Defining mechanical and physical properties including cleanliness. Part 2 : Defining flammability. This sand is not specifically designed for loose lay playground surfacing, however, if laid at 150mm depth the sand fulfils attenuation properties as defined in BS EN 1177 Impact Absorbing Playground Surfacing for critical fall heights of up to 600mm. Responsibly and safely discard/recycle plastic packaging. View entire Recreation Sand range? 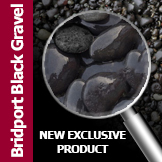 Design Specify: Purple recreation sand from Specialist Aggregates.